David Daniel Fales (born October 4, 1990) is an American football quarterback for the Chicago Bears of the National Football League (NFL). He was drafted by the Chicago Bears in the sixth round of the 2014 NFL Draft. He played college football at San Jose State. Fales played high school football at Palma School in Salinas, California. After redshirting freshman year for the Nevada Wolfpack of the University of Nevada, Reno, Fales attended Monterey Peninsula College for two years and transferred to San Jose State University for his junior year in 2012. Under Fales, the San Jose State Spartans went 11-2 in 2012 with the school's first-ever BCS ranking, first AP Poll ranking since 1975, and first bowl game berth since 2006. With 31 touchdown passes in his first year with San Jose State, Fales was the most accurate FBS quarterback for the 2012 season and was MVP of the 2012 Military Bowl. Fales was born and raised in Salinas, California. A 2009 graduate of Palma High School in Salinas, Fales was twice selected as all-league as quarterback. Palma named junior Fales the starting quarterback after the fourth game of 2007 after the regular starter suffered a severe concussion. In his first game as starter on October 5, a 35–3 win over rival Salinas, Fales completed 5 of 10 passes for 57 yards, including one 26-yard touchdown pass. Palma also had over 200 rushing yards. With an 8-2 record for the regular 2007 season, Palma lost the first round Central Coast Section playoff game 20–14 to Los Gatos on November 16 after Fales lost a fumble with 1:33 left. As a senior, Fales was Tri-County League offensive MVP. In Palma's homecoming game on October 10, 2008, Fales completed 15 of 19 passes for 164 yards and ran for two touchdowns in a 21–14 victory over Seaside. In his junior and senior years, Fales threw 31 touchdowns and nine interceptions on 220-for-319 passing over 3,267 yards. Having attracted little attention from college recruiters, Fales accepted a scholarship from the University of Nevada, Reno, the first school to offer him one. Other colleges that expressed interest in Fales included Boise State, Colorado, Colorado State, Kansas State, Oregon State, and Utah, but none of them offered scholarships. Scout.com ranked Fales #115 among quarterbacks in the U.S.
A two-star recruit, Fales attracted one offer from Nevada. On July 28, 2008, Fales signed with Nevada. Fales also attended a summer camp for Oregon State. At Nevada, Fales redshirted his freshman year in 2009, behind starter and future NFL quarterback Colin Kaepernick. Fales later explained why he left Nevada: "I realized that what they wanted to do wasn't a good fit for me. They wanted me to be more of a runner." In 2010, Fales returned home to Monterey County and transferred to Monterey Peninsula College. According to Fales, he "had a previous relationship with the head coach (Mike Rasmussen)" at the college. Fales was a two-time all-conference selection and completed 61.8 percent of passes for 4,635 yards and 37 touchdowns. After Wyoming offered Fales a non-scholarship position, Fales took a summer class at Wyoming in 2011 but returned to Monterey Peninsula for the fall. For the 2011 season with Fales, Monterey Peninsula was 2011 Coast Conference co-champion and qualified for the Sierra Central Credit Union Bowl. Fales was among the top ten junior college quarterbacks in number of completions, completion rate, passing yards, touchdown passes, and passer efficiency. "2012 San Jose St. Football Commitment List". Rivals.com. Retrieved August 4, 2013. "2012 San Jose State College Football Team Recruiting Prospects". Scout.com. Retrieved August 4, 2013. "2012 Team Ranking". Rivals.com. Retrieved August 4, 2013. "San Jose State 2012 Football Commits". 247sports.com. Retrieved August 4, 2013. During the 2011 season, San Jose State found itself without a viable future starting quarterback after Tate Forcier, who was redshirting a year after transferring from Michigan, withdrew from San Jose State. Recruiting coordinator Terry Malley suggested recruiting Fales, and quarterbacks coach John DeFilippo met with Fales at Monterey Peninsula College. DeFilippo would later comment about Fales: "They did a great job with him at MPC. They ran a similar offense to what we had, a pro style. So I knew the learning curve wouldn't be as steep as with a guy coming from the spread offense." In December 2011, Fales signed a letter of intent for San Jose State University. The FCS school Indiana State University also offered Fales a scholarship. Fales enters the field of Spartan Stadium prior to the September 15, 2012 game. On August 23, 2012, following summer training camps, coach Mike MacIntyre named Fales the starting quarterback. 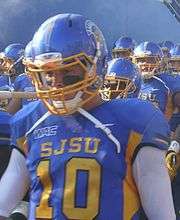 Fales debuted for San Jose State on August 31 against Stanford. In San Jose State's 20-17 loss, Fales completed 24 for 35 passes for 216 yards, one touchdown, and one interception. After SJSU trailed Stanford 17-3 at halftime, Fales capped a third quarter rally with a 21-yard touchdown pass to Noel Grigsby. Following the extra point, the game was tied at 17. Fales's interception occurred with one minute and 10 seconds left in the fourth quarter, and Stanford ran out the clock to win the game. Fales was also sacked three times for a loss of 17 yards but also had one 8-yard run. For the next two games, both at home against UC Davis on September 8 and Colorado State on September 15, Fales had interception-free games with a total of four touchdowns: one on September 8 and three on September 15. On September 22, in a 38-34 road victory over San Diego State, Fales completed 21 of 31 passes for 260 yards, four touchdowns, and an interception. The lead changed four times in the fourth quarter after one tie. With 50 seconds left in the game, Fales capped a five-play, 65-yard drive with the winning 14-yard touchdown pass to Chandler Jones. Fales had a season-high completion percentage of 85.3 percent (29-for-34, 276 yards) in San Jose State's 12-0 road victory over Navy on September 29 but threw no touchdowns and one interception. By then, San Jose State was 4-1, the best start since its 2006 New Mexico Bowl championship season. Fales drops back to pass in the 2012 Military Bowl, for which he was named MVP. Despite this start, San Jose State would lose its homecoming game 49-27 to Utah State on October 13. Although Fales completed 38 of 50 passes for three touchdowns and no interceptions, Fales was sacked 13 times for a total loss of 102 yards. Fales also lost a fumble late in the game, and Utah State scored its final touchdown off that turnover. After this loss, Fales would lead SJSU to four straight wins and an 8-2 record by November 10. In those four games, three of which were away games, Fales threw 13 touchdowns and 4 interceptions. By November, Fales was approaching school records for career passing yards and touchdowns. On November 17, San Jose State won its ninth game of the year and reached its first nine-win season since 2006. In a game nationally televised on ESPN2, Fales completed 25 of 34 passes for 305 yards for three touchdowns and one interception in San Jose State's 20-14 win over BYU. Those three touchdowns all came from San Jose State's first three offensive drives. San Jose State's next game, the season finale victory on November 24 against Louisiana Tech, again was nationally televised on ESPN2. For the sixth time this season, Fales passed for more than 300 yards, as he completed 25 of 37 passes for three touchdowns and an interception. For the regular 2012 season, Fales threw for 3,798 yards with 31 touchdowns and nine interceptions. With a completion rate of 72.1 percent, Fales was the most accurate passer and third in efficiency nationally among FBS starting quarterbacks. On November 25, San Jose State made the 24th spot in the Bowl Championship Series (BCS) Top 25 rankings. This was San Jose State's first-ever BCS ranking and first national ranking since 1990. The following week, both the AP Poll and USA Today Coaches' Poll ranked San Jose State 24th in the top 25. This ranking marked San Jose State's first top-25 AP ranking since 1975. San Jose State also played its first bowl game since the 2006 New Mexico Bowl. 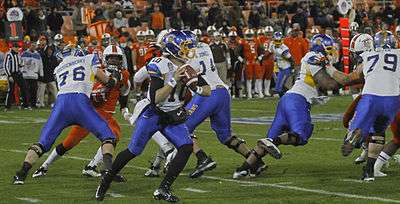 On December 27, San Jose State defeated Bowling Green in the 2012 Military Bowl by a score of 29-20. With 33 of 43 passes completed for 395 yards and 2 touchdowns, Fales was named the game's most valuable player. Prior to the 2013 season, Fales was being projected as a first round pick in the 2014 NFL Draft. San Jose State started off 2013 with a 24-0 win over Sacramento State on August 29. Fales completed 16 of 32 passes for 225 yards and 2 touchdowns. The next game on September 7, in a 34-13 loss to Stanford, Fales completed 29 of 43 passes for 216 yards, 1 touchdown, and 1 interception and was sacked 4 times for 39 lost yards. Fales again played well on September 24 with 29 of 43 passes completed for 216 yards, 1 touchdown, and 1 interception, but San Jose State lost to Minnesota 43-24. On September 27 in a 40-12 loss to Utah State, Fales completed 25 of 48 passes for 314 yards and 2 interceptions. In contrast to last year's game against Utah State where he was sacked 13 times, Fales was sacked only once in this game. San Jose State won on October 5, 37-27 over Hawaii. Fales completed 16 of 35 passes for 318 yards, 3 touchdowns, and 2 interceptions. In a 31-0 run that followed a 14-3 first quarter deficit, Fales threw touchdowns of 61, 35, and 27 yards. On October 12, in Colorado State's homecoming game, San Jose State won 34-27. Completing 28 of 35 passes for 431 yards, Fales threw 3 touchdowns of 83, 77, and 62 yards. According to The Coloradoan, Fales completed several of his passes after eluding backfield defenders. Excluding two sacks for a loss of 13 yards, Fales had a career-high 33 rushing yards on 7 scrambles. Following the game, the NCAA ranked Colorado State next-to-last in pass defense efficiency among all FBS teams. With 5:36 left in the game, Fales threw the winning touchdown 62 yards to true freshman wide receiver Tyler Winston. Following a bye week, San Jose State won its homecoming game on October 26, 51-44 over Wyoming. Fales reached new career highs in passing yardage and touchdowns as he completed 27 of 37 passes for 482 yards and 5 touchdowns; Fales also scored the winning touchdown on a 1-yard sneak with 8 seconds left. This was also Fales's fifth consecutive game with over 300 passing yards, a Mountain West Conference record. After starting the season 5-3, San Jose State then lost three in a row. On November 9, San Jose State lost 34-30 to San Diego State after leading for most of the game. On fourth down with 2:35 left, Fales threw an interception, and San Diego State won after running out the clock. Fales had three touchdown passes. One of the touchdowns came after a trick play in which Fales pitched the ball to wide receiver Tim Crawley, who pitched the ball back. Fales then passed deep to Chandler Jones for a 40-yard touchdown. In San Jose State's loss to Nevada the following week, Fales completed 28 of 43 passes for 326 yards and a touchdown. On November 2, in a home game against Navy nationally televised on ESPN2's College Football Friday Primetime, Fales completed 42 of 56 passes for 440 yards and again had 5 passing touchdowns. However, San Jose State lost 58-52 in triple overtime after Fales threw an interception during the third overtime, and Navy quarterback Keenan Reynolds then scored the winning touchdown. San Jose State finished 6-6 after beating AP 16th-ranked and 11-0 Fresno State 62-52 in San Jose on November 29. Fales threw a career-high six touchdown passes and single-game school record 547 yards. Despite a bowl-eligible 6-6 record, San Jose State did not receive a bowl game invitation. Fales finished his San Jose State career breaking Adam Tafralis's San Jose State records for career pass completions (639) and career total offense (8,250 yards) and Fales's own record for single-season total offense (4,196 yards). Fales surpassed Steve Clarkson's previous record with 66 career touchdown passes and Tafralis's previous record with 8,382 passing yards. Fales was selected by the Chicago Bears in the 6th round of the 2014 NFL Draft. Fales is the first San Jose State quarterback to be drafted since Mike Perez in 1988, and the fourth in school history since the AFL-NFL merger. On May 12, 2014, Fales signed a four-year contract with the Bears. Fales ended a 26-year drought for San Jose State quarterbacks being drafting in the NFL when he was selected by the Bears. "It’s an honor," Fales said. "I’m excited to be representing San Jose State." Fales is the schools record holder in every significant passing category including career and single season marks in passing-yards and touchdowns. David will be competing in this year’s training camp, to backup Bears starter and often injured Jay Cutler. Fales will try to become San Jose States first quarterback since Jeff Garcia to play in the NFL. Fales played sparingly throughout the 2014 preseason, where he saw most of his action in the finale. With Fales still fighting for a spot on the final roster with the other backup quarterbacks, he was given the start and saw significant playing time in the final preseason game of 2014. In that game, Fales made a good case for himself to make the team, by finishing the game going 13 of 24 for 146 yards and a touchdown. However, Fales was waived on September 12. After he cleared waivers, he was signed to the Bears' practice squad on September 14. On December 13, 2014, Fales was elevated from the Bears' practice squad to the team's 53-man roster. The move came right after the New England Patriots attempted to sign Fales. On November 23, 2015, Fales was promoted once again to the active roster after Jimmy Clausen was waived. On September 3, 2016, he was released by the Bears as part of final roster cuts. On September 6, 2016, Fales was signed to the Baltimore Ravens' practice squad. He was released by the Ravens on November 8, 2016 but was re-signed two days later, only to be released again on November 15. He was re-signed again to the practice squad on November 19. On November 23, 2016, Fales was signed by the Bears from the Ravens' practice squad. 1 2 3 4 5 6 Wilner, Jon (September 26, 2012). "Quarterback David Fales behind San Jose State's hot start". San Jose Mercury News. 1 2 3 4 5 "David Fales". San Jose State Spartans. Archived from the original on January 29, 2014. Retrieved August 24, 2016. ↑ DeVine, John (October 1, 2007). "Good news for Palma quarterback". Monterey County Herald. Archived from the original on October 6, 2007. ↑ Watkins, George (October 6, 2007). "Cowboys are no contest for Palma; Chieftains get back to dominating form". Salinas Californian. Archived from the original on November 8, 2007. ↑ Taylor, Dennis (November 17, 2007). "Palma rally reversed by Los Gatos' trick play". Monterey County Herald. Archived from the original on November 19, 2007. ↑ Wallace, Ryan (October 11, 2008). "Upset bid comes up short for the Spartans". The Salinas Californian. Archived from the original on October 13, 2008. 1 2 "David Fales - 2008 Palma HS - SR". scout.com. Fox Sports. Retrieved August 6, 2013. ↑ Johnson, Brian. 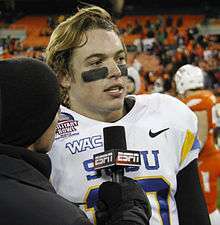 "College Player Spotlight: San Jose State QB David Fales Q&A". Retrieved 15 July 2013. ↑ "Productive QB & Versatile DB Open 2012 Recruiting". San Jose State Athletics. December 28, 2011. Archived from the original on May 28, 2012. Retrieved December 14, 2012. ↑ "David Fales Named Starting Quarterback". San Jose State Spartans. August 23, 2012. Archived from the original on July 1, 2013. ↑ Gonzalez, Anthony (August 31, 2012). "San Jose State scares No. 21 Stanford, loses 20-17". Associated Press. Retrieved December 13, 2012. Also published by ESPN.com as "No. 21 Stanford holds off San Jose State as new QB struggles". 1 2 3 4 5 6 "David Fales game log 2012". rivals.com. Retrieved December 13, 2012. ↑ "San Jose State Spartans vs. Stanford Cardinal - Box Score". ESPN. Retrieved December 14, 2012. ↑ Durkin, Jimmy (September 23, 2012). "San Jose State rallies to beat San Diego State 38-34 to improve to 3-1". San Jose Mercury News. Archived from the original on October 6, 2012. ↑ "Navy offense shut down by San Jose State 12-0". Associated Press. September 29, 2012. Retrieved December 13, 2012. ↑ Durkin, Jimmy (October 14, 2012). "San Jose State loses 49-27 to Utah State". San Jose Mercury News. Retrieved December 13, 2012. ↑ "SACK ATTACK: USU records 13 sacks in 49-27 shellacking of San Jose State". Cache Valley Daily. October 14, 2012. Retrieved August 26, 2013. ↑ Durkin, Jimmy (November 9, 2012). "San Jose State's David Fales already chasing records". San Jose Mercury News. Archived from the original on November 11, 2013. ↑ Durkin, Jimmy (November 18, 2012). "San Jose State defeats BYU 20-14". San Jose Mercury News. Archived from the original on November 11, 2013. ↑ Durkin, Jimmy (November 25, 2012). "San Jose State caps regular season with 52-43 thriller over Louisiana Tech". San Jose Mercury News. Archived from the original on November 11, 2013. ↑ "David Fales". rivals.com. Retrieved December 13, 2012. ↑ "Slew of Spartans receive national, conference recognition". CSN Bay Area. November 26, 2012. Retrieved December 14, 2012. ↑ Johnston, Joey. "The good, the bad, the ugly of bowl season". NBC Sports. Retrieved December 14, 2012. ↑ Durkin, Jimmy (November 25, 2012). "San Jose State ranked No. 25 in BCS". San Jose Mercury News. Archived from the original on May 17, 2013. ↑ Durkin, Jimmy (December 2, 2012). "San Jose State ranked No. 24 in BCS and both national polls". San Jose Mercury News. Archived from the original on December 16, 2013. ↑ Durkin, Jimmy (December 28, 2012). "San Jose State Spartans win Military Bowl 29-20". San Jose Mercury News. Archived from the original on January 4, 2013. Retrieved December 28, 2012. ↑ White, Joseph (December 27, 2012). "San Jose State tops Bowling Green in Military Bowl". Associated Press. Retrieved December 28, 2012. Also published by ESPN.com as "San Jose State caps turnaround year with win in Military Bowl". ↑ "2014 NFL Mock Draft: David Fales is a first round pick". 2013-04-30. ↑ "Walter Football". WalterFootball. 2013-06-30. Archived from the original on August 11, 2013. 1 2 "David Fales Game Log". Yahoo Sports. Retrieved October 30, 2013. ↑ Takase, Kalani (October 6, 2013). "Fales throws San Jose State past Hawaii, 37-27". Associated Press. Retrieved October 30, 2013. ↑ Lyell, Kelly (October 13, 2013). "Homecoming blues: Rams face tough loss against San Jose State". The Coloradoan. Archived from the original on August 10, 2014. ↑ Lyell, Kelly (October 15, 2013). "Colorado State football team can't stop the pass". The Coloradoan. ↑ Durkin, Jimmy (October 13, 2013). "San Jose State wins as David Fales throws for 431 yards". San Jose Mercury News. Retrieved October 30, 2013. ↑ Durkin, Jimmy (October 27, 2013). "San Jose State rallies past Wyoming 51-44". San Jose Mercury News. Retrieved October 30, 2013. 1 2 Durkin, Jimmy (November 10, 2013). "San Jose State can't hold off San Diego State". San Jose Mercury News. Retrieved December 21, 2013. ↑ Durkin, Jimmy (November 23, 2013). "San Jose State rallies, but loses to Navy in overtime thriller". San Jose Mercury News. Retrieved December 21, 2013. ↑ Durkin, Jimmy (November 30, 2013). "San Jose State stuns Fresno State 62-52". San Jose Mercury News. Retrieved December 21, 2013. ↑ Durkin, Jimmy (December 9, 2013). "San Jose State shut out of bowl". San Jose Mercury News. Retrieved December 21, 2013. ↑ "NFL Combine profile for David Fales". NFL.com. Retrieved 2014-05-10. ↑ Durkin, James (May 10, 2014). "NFL draft: San Jose State's David Fales selected in sixth round by Chicago Bears". San Jose Mercury News. Retrieved May 10, 2014. ↑ "Bears Agree To Terms With Vereen, Fales On Four-Year Contracts". CBS Chicago. May 12, 2014. Retrieved May 24, 2014. ↑ Campbell, Rich (September 12, 2014). "Bears cut Fales, Hayden to create roster space". Chicago Tribune. Retrieved September 12, 2014. ↑ Mayer, Larry (September 14, 2014). "Fiammetta, Fales back with Bears". Chicago Bears. Retrieved September 15, 2014. ↑ Wiederer, Dan (December 13, 2014). "Bears promote rookie QB David Fales to active roster". Chicago Tribune. Retrieved December 13, 2014. ↑ "Bears promote rookie QB David Fales to active roster". ↑ Mayer, Larry. "Bears trim 22 to reach 53-man limit". ChicagoBears.com. ↑ "Ravens Sign Quarterback David Fales, Complete Practice Squad". ↑ Bouda, Nate (November 8, 2016). "Ravens Waive QB David Fales From Practice Squad, Sign CB Robertson Daniel". ↑ Mink, Ryan (November 15, 2016). "Ravens Promote DB Asa Jackson, Place DT Willie Henry on Injured Reserve". BaltimoreRavens.com. ↑ "Ravens Re-Signing QB David Fales To Practice Squad, Cut TE Austin Traylor". November 19, 2016. ↑ Mayer, Larry (November 23, 2016). "Bears re-sign Fales, put Miller on IR". ChicagoBears.com. Wikimedia Commons has media related to David Fales.